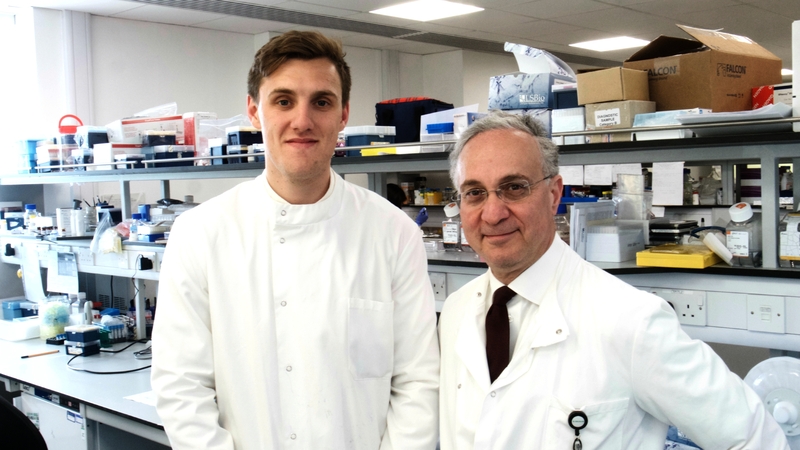 Professor Naiem Moiemen (pictured right with Principal Researcher Robert Dinsdale) is Director of The Scar Free Foundation Centre for Burns Research at Birmingham’s Queen Elizabeth Hospital. We spoke to Naiem about SIFTI-II (Scientific Investigation of the Biological Pathways Following Thermal Injury), a major cohort study which is investigating what happens in the body following a serious burn injury, and tracks the cellular processes behind scarring. What is SIFTI-II investigating and why is it so important? SIFTI-II is a follow up from a cohort study – completed last year – which tracked 150 patients with serious burns (to more than 15% of their body) over the period of a year. One of the key things to come out of this study was the discovery of three markers in the blood which together can, with great accuracy, predict sepsis on the day of injury. Sepsis is a life-threatening condition that arises when the body's response to infection injures its own tissues and organs. People who suffer a major burn are placed at high risk of sepsis and other fatal infections, which generally present about five days after the initial injury. Currently however early diagnosis is problematic as the body’s immediate inflammatory response to the injury often masks many of the clinical markers of infection. By predicting sepsis at the point of admission to hospital we can fight the infection early through antibiotics and targeted treatments. SIFTI-II is a far bigger study – we plan to recruit 245 patients and 30 healthy volunteers from burns centres across the UK. This study is important firstly because it will allow us to validate the sepsis blood test by daily sampling for the first 14 days after injury. The study is also unique in tracking a large cohort of burns patients over a longer period of time, from within hours of their injury. Secondly, through matched blood, urine and tissue samples taken over a six-month period we will be able to look at potential biomarkers over time to see if they are linked to scarring further down the line. What impact will this study have on patients? When we set off on the first SIFTI study five years ago we wanted to ensure that our research was not just “blue sky.” We wanted there to be a direct benefit to patients as a result – from better detection of risk factors through to more targeted drugs and treatment. We now know how to accurately predict sepsis by looking at a set of white blood cells that provide front-line protection against fast-developing infections, but which stop properly working following thermal injury. The issue with the blood test we have developed is that it requires lab work not possible in many hospitals. The next step will be to look at whether we can build on this research to develop a single test that can be carried out at the bedside. At the same time, now that we know the biological processes that give rise to infection we can, in collaboration with industry, try out directed drugs to start to modulate the body’s immune response. The end goal of developing a drug that prevents sepsis and serious infections, and removes the need for heavy-duty antibiotics would benefit the entire patient population. How does your research contribute to our vision of a world without scarring? The study means we can explore biomarkers in the tissue and the blood that might influence why, with similar injuries, one patient will be left with bad scarring and another with minimal scars. We are investigating two proteins – Decorin and TGF-β1 – which are shown to have a spike in levels in the first few weeks following a burns injury. Our challenge will be to see if there is a correlation between the levels of these proteins and scarring a year and then eighteen months down the line. If there is, then it may be possible to treat scarring by modulating their production. At the Centre for Burns Research we are also conducting several studies with a “scar free” focus. These include a first-in-man trial – funded by The Wellcome Trust and due to start next year – for a new anti-scarring dressing.